Learn how to create a website in a few simple steps with a site builder that’s so easy to use you will love it. You can even sell your stuff from your site and it won’t cost you any extra, no upgrade just add products to your store page and start selling your stuff online. You get a free domain name when you sign up and can try the web site builder free for 30 days and see if right for you, no credit card needed. If you have been searching the internet for search terms like how to create a website or how to build a website you will find lots of websites that show you how to create a website. Some will have offers on how to create a website free, others will offer you web hosting for a few dollars others like Easysite let you try their website software free for 30 days. You have to make a choice and choose one of the ways to create your website. Hopefully you make the right choice. 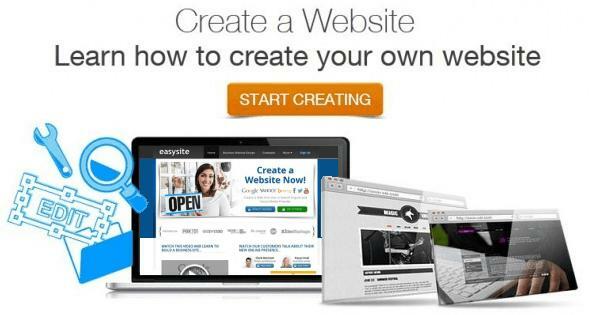 Here at Easysite we would like to help you get your business online and before you spend one dollar we invite you to try our site builder for free to build a website with, that way you can try before you buy. Because its so simple to use, when you sign up to Easysite.com there is no plugins to install, no need to pay for templates all the tools you require to create your own website are built in to the site builder. Lets think about these this. Site builders that let you create a free website are limited, after all something that is offered to you free must have a catch. Creating a free website is not a good idea, here are a few reasons why you should not build a free website. Free site builders will host far to many sites on the one server, this means that your free site will load slow. Visitors and search engines hate slow loading sites and search engines even rank slow loading sites lower in their results. The web address has the free site builder address included with your site address. Visitors will see this and know you are creating a free website. Example: (freesite.yoursite.com). There will be lots of important features missing from the site builder as you start to build a website. You will only get those features when you upgrade, and it will cost you to upgrade. You never own your content when you create a free website. If they don’t get enough people to upgrade they don’t make money and could close down and that means your free site and its content is gone for-ever. Don’t think you can start of free and move to a better site builder or even move to WordPress. The coding is different and moving will be one big mission. Rather start off right. In our opinion making a free website is not a good idea, free websites don’t work. Don’t waste your time trying to create a free site. Rather look for a free trial site builder like Easysite. Easysite lets you try all the features. No credit card. No money needed. We are so confident you will love our website building software to create your website we let you use it free for 30 days. WordPress, what is WordPress? WordPress is an online, open source website creation tool written in PHP. It’s a powerful blogging and website content management system, used to create websites. WordPress is free to use and has to be installed on to a hosting provider. So you must find the right hosting provider remember cheaper is not always best. Once you have signed up to a hosting company you will need to download and install WordPress onto your hosting account, add a domain or buy a domain if you don’t already own one, and install WordPress from your hosting control panel (cPannel). Once you have installed WordPress you need to find SEO plugins, caching plugins, and lots of other plugins to add those extra features to your site. It can all be very confusing and frustrating especially if you are not very clued up on website design. WordPress is great if you know what you are doing. If you have never used it then you going to have to find out what plugins you need, how to install and activate them. You are going to have to learn how to create a website with WordPress and this could take some time. If you are looking for a way to create a great looking website with out all the extra hassle, all the features in one place then try Easysite.com. We understand that you are busy with your business and might not have the time to set up and design a website yourself. Why not let Easysite make a website for you. Our mission is to get your business online, you can use our site builder to create a website yourself or we can build a 5 page website for you in less than two weeks. Step 1) Sign up to Easysite here. Step 2) Pay $249.00 for your 5 page website. Step 3) Supply your logo, images and content. Step 4) Social networks you would like linked from your site. You can call Easysite at 877 832-7974. We will ask a few questions about the type of site you want us to build and ask for your contact details. Next our designer will contact you to find out more about the type of site you would like designed and get your sites content. Content is for – home page, about page, contact page and two other pages of your choice. Once we receive all the content allow 7 to 10 working days for us to create your site.